Believe it or not, but there was a time when I was completely at sea when it came to cooking and Chilli con Carne was my only lifeline! Admittedly back in my university days, my Chilli’s “secret ingredient” was a packet of Knorr Chilli con Carne flavouring, but given the dish was also made with cheap soya mince, the dubious origins of its flavour-base was the least of its problems! That said, my Chilli was still the stuff of legend in my digs and its fame wasn’t without merit. In spite of its shortcomings it still tasted pretty damn good, but given my only real competition was marmite on toast, my culinary supremacy was pretty much a given! Mercifully, my cooking has improved somewhat since those dark days and my Chilli con Carne has since had a much needed makeover. Rather unsurprisingly, the soya mince and glorified packets of MSG have fallen to the wayside and have been replaced with more natural ingredients, but don’t be fooled – this is still good eating, just on a slightly improved budget! Aside from the exclusion of various e-numbers and MSG, key to the elevation of my Chilli from student fare to tex-mex bliss is the inclusion of some dark chocolate. By simply adding a bit of chocolate, this dish develops a depth of flavour that is hard to beat…give the Chilli sufficient time to mellow and you’ll have an overnight sensation! There are many ways to eat Chilli. You can simply serve it with some plain white rice, topped with a spoonful of sour cream and snipped chives or you can use it as a filling for burritos by wrapping it up in a tortilla with salad and guacamole. 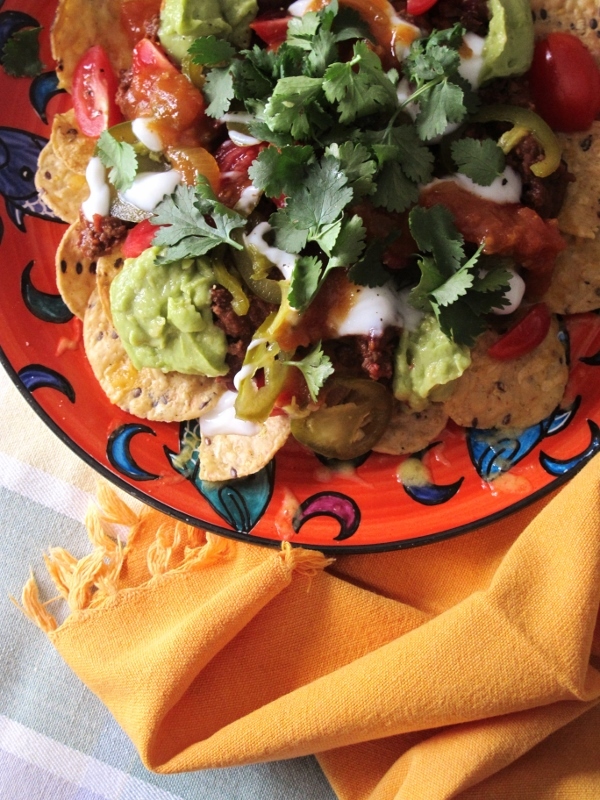 These days, however, my favourite way to eat Chilli is by making nachos! Simply add the chilli to a pile of tortilla chips, sprinkle with all your favourite toppings and voilà: nachos’fantastico!